The new next big thing is Telepresence robots. At least that’s what some people think. I think not. With any luck, telepresence robots are currently experiencing their peak in popularity. That probably isn’t the case – telepresence robots may become the perfect yardstick for ego measurement, but I seriously doubt they will positively impact productivity. With VoIP, web technologies, thin clients, and collaboration tools remote productivity has been steadily increasing. A decade ago remote workers were out of the loop. Tolerated, but never encouraged. Today, it seem pretty common – even people that still work in the office are often collaborating with remote contributors.”Teleworking” moved from futuristic to a common happenstance within a decade. Several new companies are betting these remote workers will create a business opportunity for improved ways to interact with the folks at the office. Even with videoconferencing technologies – most remote workers rarely get to see things outside the conference room. They are missing out on important venues such as office corridors, water coolers, break rooms, rest rooms, and other important places. Clearly, no remote worker is complete without a personal telepresence robot. A webcam and speaker saucer atop a Segway remotely controlled by a colleague, boss, or who knows is just outright creepy. Something destined to be locked in a closet or pushed down the stairs. That could be a great who dunnit. But I don’t see it as a model of productivity, I keep envisioning a robot repeatedly bouncing off the same wall, struck trying to navigate over a thick cord or something. Imagine a bot stopping and chatting at a cube. Reminds me of that guy five tables away last night on his cell phone yapping details about his recent trip to Omaha. I didn’t find him distracting at all. But rather than just call a moronic idea a stupid idea, I do have an alternative suggestion: a Surrogate. 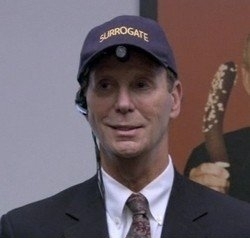 In the television series ‘Arrested Development’, Bob Mittleman (AKA Super Dave AKA Marty Funkhouser AKA Bob Einstein) played a Surrogate Dad while the real father was under home arrest. Bob went about the father’s business connected back with a webcam under hisvisor and a headset in one ear. The Dad watched and participated remotely from his laptop. Brilliant. Not only is a human surrogate capable of navigating elevators, stairs, escalators, and parking lots – but a human surrogate won’t freak-out colleagues like a robot would, and it offers partial relief to unemployment. Actually, everyone wearing a webcam could really improve office communications. It should also be noted that the accessories on the human surrogate are cheaper and easier to upgrade than the hardware on a $15k robot stuck in the elevator because it can’t push a button.